Don’t forget that you can get a FREE vanilla cone tomorrow. 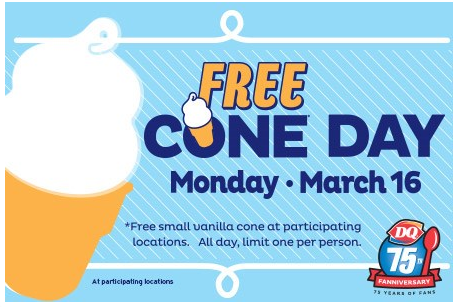 Head to Dairy Queen on free cone day, 3/16, to get a FREE ice cream cone. Each customer can get (1) free vanilla cone. Be sure to call ahead to make sure your store is participating.